Back to school tips to reduce anxiety and bullying are important because, as sad as it might be, bullying today is as bad as it ever was. Despite a ton of news coverage and plenty of press, the problem remains. Sadly, it is a social problem that is multi-faceted. That means it will take time and plenty of dedication to overcome it. The best we can do right now is find ways to train our kids to deal with bullying and wipe it out one case at a time. No kid should be targeted by bullies….ever. That said, the kids that seem to get targeted are generally those that are easy victims. Like criminals, bullies tend to pick out the perceived weakest of the bunch. They like to find those that seem meek or timid on the surface. Your child can offset that to a certain degree by gaining some confidence in themselves and their abilities. One wonderful way to do this is to enroll them in a self defense course. This is not teaching them violence. This allows them to know how to take care of themselves and walk with confidence in that fact. Involve them in a sport or other activity that can boost their confidence. Being around others that share their interests will boost their social confidence a great deal and give them new friends to hang out with. 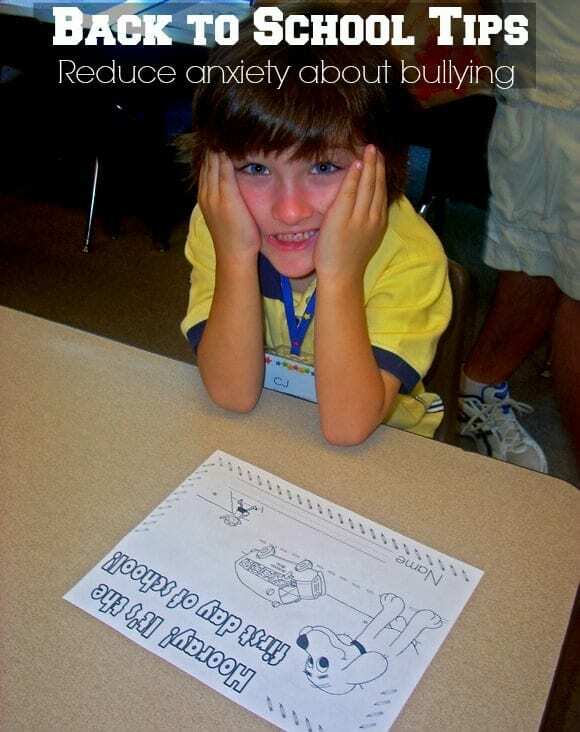 This is one of the most important back to school tips to reduce anxiety and bullying. Tell your child that you are their teammate in the bullying thing. Explain to them that you want to know every detail of their situation and that you will do all you can to help them. Kids that are bullied often feel embarrassed or alone. The worst that can happen is for your kid to feel this way. That will cause them to retreat and keep it inside. This silence is what drives bullying to dangerous levels. Every day, check in with your child. Let them know about times in your life or others where bullying happened. Share details and it will help them to not feel alone in their situation. Explain that you will always be there and that they are never going to be alone in this problem. One thing is abundantly clear with stalking and bullying cases…documentation is everything. Write down names, dates, witnesses and every single detail your child can remember. This is vital to show a pattern in extreme cases. You want to be able to go to the authorities and show what has happened in a clear timeline. This can get action where others may not be able to do so. Also, take the time to tell folks what is going on. Tell every teacher that will listen. Tell office employees…tell the principles. Tell the campus police officers. The more people that are aware of your kid’s situation, the harder you will make it on their bully to continue with the harassment. If the bullying doesn’t stop, don’t be afraid to go to higher ups. Keep riding the school system until you get some answers and cooperation. They are very busy and sometimes don’t get the seriousness of the situation. It is our job as parents to be sure they have no choice but to see it. Be your child’s number one advocate and mouthpiece. That’s probably the absolute most important of the back to school tips to help kid overcome anxiety. Do you have any back to school tips to help reduce anxiety and bullying? Share in the comments! It can be hard to go back to school–not only because it means no more watching tv all day. I try to build excitement as we go back, but I should have a talk about the possibilities of bullying & what to do. Oh goodness! Is it almost back to school? I worry about my son being bullied. I know he’ll stand up for himself but kids can be quite cruel. I think these are definitely important lessons. We haven’t had much problems with bullying. These are great tips. I think I might look into a self defense class for my kids. Such important advice. I will talk to my kids about bullying. This is so important! I will be talking to my daughter about this! The last point is really important, I think. Kids need to know that there are some things that can’t be handled alone regardless of what age you are.